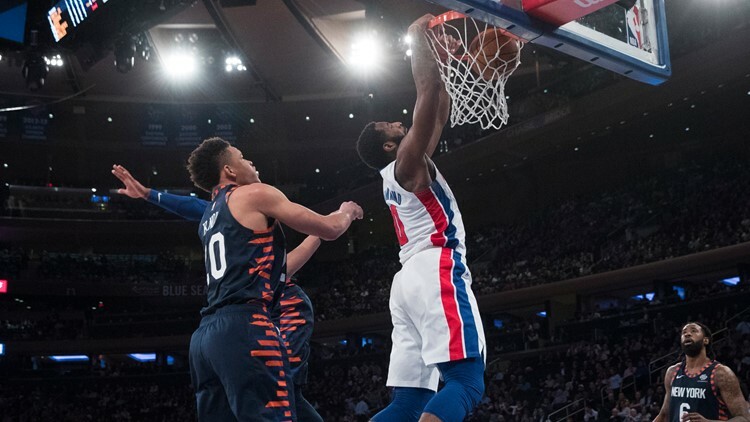 NEW YORK — Blake Griffin scored 29 points and Andre Drummond finished with 17 points and 16 rebounds as the Detroit Pistons beat New York 105-92 on Tuesday night, handing the Knicks their 14th straight loss. Dennis Smith Jr. had 25 points in his second game for New York, which has also lost a franchise-record 15 straight at home. Mitchell Robinson had 13 points and 10 rebounds, and Kevin Knox scored 11 points. The Knicks haven't won since Jan. 4 against the Lakers in Los Angeles. Their last win at Madison Square Garden was a 136-134 overtime victory against Milwaukee on Dec. 1. The Knicks pulled to 43-42 on Allonzo Trier's layup with 8:07 left in the second quarter. However, Detroit scored the next six points and pushed its lead to 63-54 at halftime. New York pulled to 70-67 on Smith's 3-pointer midway through the third, but the Knicks still trailed 78-71 heading into the fourth. The Pistons scored the first five points of the final quarter and took another 12-point lead. Damyean Dotson's 3 got the Knicks within three with 7:52 remaining. However, Detroit scored the next eight points and went on to take a game-high 14-point lead at 100-86 on Jackson's two free throws with just under two minutes remaining. Pistons: Jackson is the only Pistons player to appear in and start in each of the team's 53 games. ... The Pistons have beaten the Knicks five straight and lead the all-time series 207-172. Knicks: The losing streak is their longest since 2014-15 when they dropped a team-record 16 straight and finished 17-65. ... Noah Vonleh is the only Knicks player to appear in all 53 of their games this season. Knox, the Knicks' lottery pick, has started 26 games during his rookie campaign. New York has gone 2-24 in those games. Named NBA Eastern Conference Rookie of the Month in December, Knox has connected on just 32.8 percent of his shots (44 of 134) since Jan. 17. Sixty percent of the Knicks' starting lineup on Tuesday (Smith Jr., Jordan, Matthews) has been on the team less than a week. Eighty percent of the Pistons' starting lineup (Bullock, Drummond, Griffin, Jackson) has started at least 44 games. The teams opened a home-and-home set with the next game Friday in Detroit. The Pistons have met the same team in back-to-back games twice so far this season, losing both to the Celtics (Oct. 27 and 30) and splitting with the Rockets (Nov. 21 and 23). The Knicks have played only one such series this season, losing to the Bucks on Dec. 25 and 27. Pistons: Host New York on Friday night. Knicks: At Detroit on Friday night.